Musically, 1980 had a great many musical highs but it also had a few lows as well. 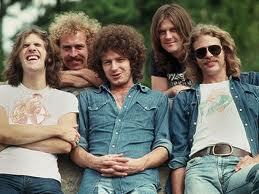 One of these was the disbanding of a band that entertained the world throughout the entire 1970’s, The Eagles. The band unofficially disbanded in July 1980 but they still owed their record company, Elektra/Asylum a live album. This magnificent live album was the result. It can be argued that this album was just a collection of all The Eagles’ greatest hits, which just happened to be recorded live. True, the album contains many of the classics which made us love them. Greats like “Hotel California,” “Take Me to the Limit,” “Heartache Tonight” and “Take It Easy” are all on their and sound brilliant live. The album even includes a live playing of the Joe Walsh solo classic, “Life’s Been Good” and a new song “Seven Bridges Road.” On the flip side, they leave out a couple of my personal favourites like “Victim of Love” and “One of These Nights” but that’s me nit picking. 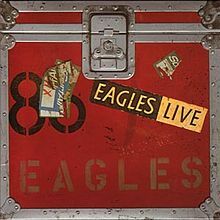 This album is The Eagles at their best on stage and for people like me who never got the chance to see them live, it makes a good consolation prize. This live album reminds us of the legacy of great music left behind by one of the greatest rock bands of the 70s. A full account of some of the great rock songs they gave us all recorded at what was considered their killer live shows. While the album is great, it also reminds us that it was what signaled the end for them. This entry was posted on July 10, 2013 at 10:23 am and is filed under 1980s, Concerts, Music, Rock, Uncategorized with tags Classic Rock, Hotel California, Joe Walsh, The 1970s, The 1980s, The Eagles, The Long Run. You can follow any responses to this entry through the RSS 2.0 feed. You can leave a response, or trackback from your own site. Nice to see a positive review about The Eagles, since so many people seem to be down on them these days. I got this double-vinyl set back in 1980 and I agree that it’s an excellent document of a great band. Thanks and you’re right, The Eagles seem to be forgotten in today’s world. Long Road Out of Eden was a decent album but I guess the problem with them is the fact that their all talented and too many egos in one room. I had to settle for having this album on cassette as I was in the marines at the time and my living space was very limited. I’m just a sucker for ‘New Kid in Town’, love that track. Very true, the disbanding of the Eagles was a low point in 1980.